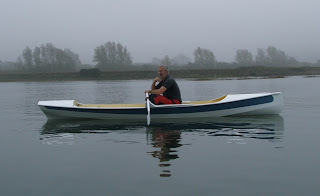 Chris Partridge of Rowing for Pleasure, had persuaded me that an early Saturday morning row over at Dell Quay would be a good idea. To make the best of the tide, we needed to be on the water and away by nine o'clock, which meant an early start for me - clearly some preparation the night before might have helped!! Dell Quay was grey and damp when we got there, but there was hardly any wind and a good day for rowing. 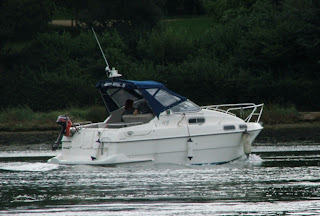 I joined Chris and his friend Chis Waite for a tour of the upper reach of Chichester Harbour. Chris Partridge is a mine of information about the area, pointing out the site of the roman settlement near the mill, and Bosham church where King Canute's daughter is said to be buried. Chris spotted a seal down near Itchenor point. Sadly by the time Chris and I had caught up in our slower boats, the seal was long gone. This is the first time I've seen Chris Waite's new boat Octavia which he launched back in June and very pretty she is. The weather brightened up on the row back against the tide, and of course by the time we had the boats back on their trailers, it was a glorious day with clear skies. 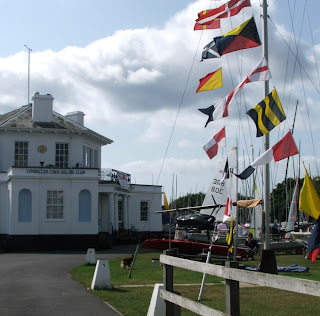 Both Chris's will be down in Bursledon next weekend for the Home Built Boat Rally which they describe as the "Amble up the Hamble" - weather permitting. 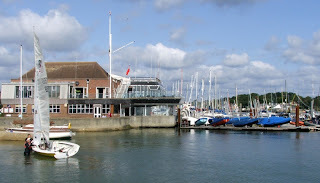 Jolie Brise returned to the Hamble in September. 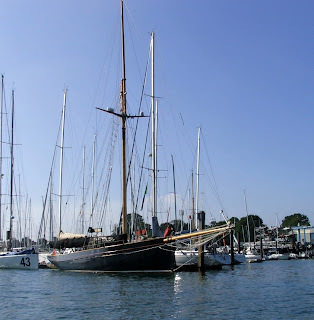 The famous pilot cutter built by Mr Paumelle in Le Harve in 1913, arrived in time to compete in the Cowes Small Tall Ships race in early October. 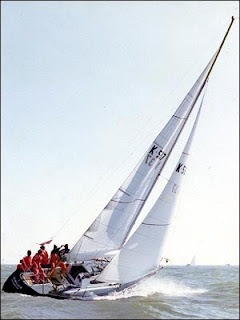 Despite a good start Jolie Brise was sadly in collision with Rona II, when the Holman & Pye designed training ship tried to tack behind Jolie Brise, but failed to free the mail sail sheet. Fortunately no one was hurt, both boats retired and the damage will be repaired over winter. 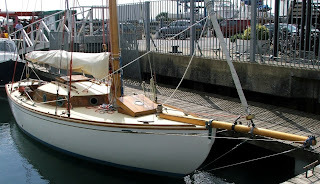 Jolie Brise famously won the first Fastnet Race back in 1925, and is now owned, maintained and sailed by the pupils of Dauntsey School. 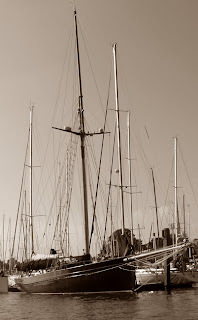 The sailing season is over, the boats are hauled out and covered for the winter, the days are getting shorter and colder - you start to miss the sailing. 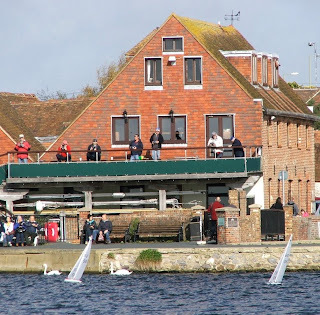 Not for these members of the Emsworth Slipper Sailing Club the clubhouse over looks the tidal mill pond, which offers ideal, sheltered sailing conditions for their fleet of radio controlled model yachts. 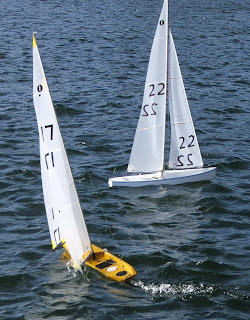 Slipper Radio Sailors meet to race 1 Metre class model yachts. A regular programme takes place throughout the year, but the major series is on Sunday mornings between October and Easter. With thoughtful planning, the sessions are nicely timed to finish as the Bar opens! What better way to get some fresh air and winter sailing. Sunday's conditions were perfect, 25 knots out in the Solent, but warm sunshine and lighter winds across the sheltered mill pond making for some spirited racing. The standard of racing is improving and some members go off to Open Meetings and Championships. The Racing Rules of Sailing are fully applied, although some members claim failing eyesight as an excuse for their infringements! 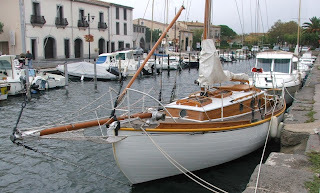 Currently around 30 members have 1 Metre yachts with numbers increasing all the time. 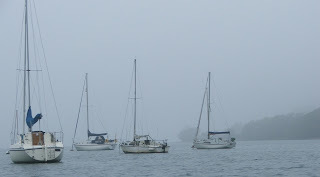 Sailing has a reputation as an expensive and elitist sport, with yachts being described as "holes in the water into which you throw £10 notes " (or the large denomination bank note of your choice). Clearly if you want a mega yacht you'd better have mega bucks to fund it, but getting out on the water doesn't have to be expensive. 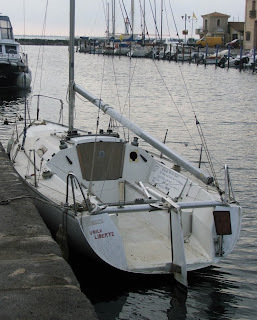 We spotted this run down First Regatta for sale, asking price Euro 2000, rumour around the port was that the owner would take an offer on that price. Now even with the current exchange, rate a 28 foot boat for under two grand seems like a good deal to me. You clearly have to accept she's not going be competitive without some serious money spent, but as a fast day sailor/weekender, lots of fun. A quick polish and a tidy up will have you afloat for not a lot. 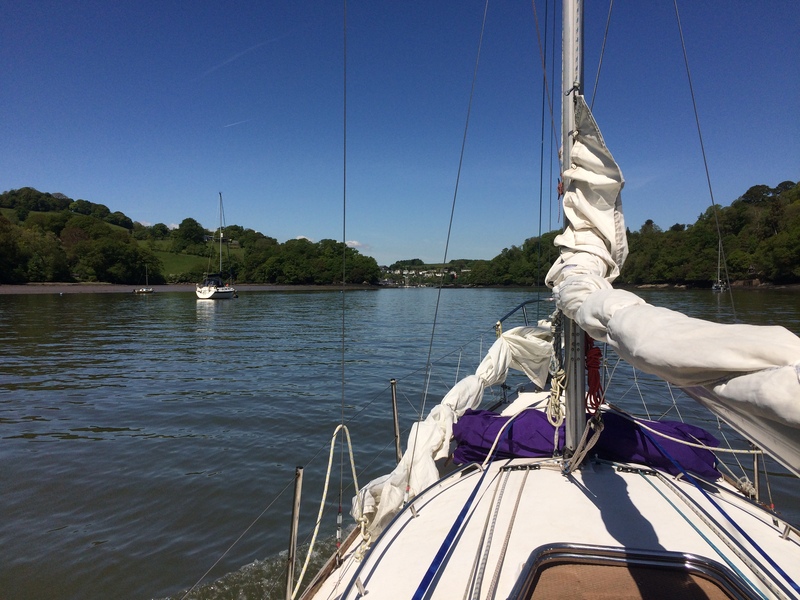 A spirited afternoon sail, followed by dinner and a couple of bottles on wine at a waterside restaurant and somewhere to crash at the end of the night. There's a lot to be said for this minimalist cruising. We normally visit the delightful Georgian town of Lymington during winter, when the tourists have all disappeared, but a few weeks ago in early September, the lure of the Saturday market and a pleasant drive through the new forest with autumn coming on was too much to resist. 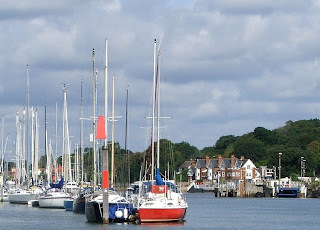 The river is a superb haven for yachts, which are packed in perhaps even more densely than our home river Hamble, however Lymington has a more relaxed, even gentile character about it. Sadly the open air swimming pool is currently closed, one of the last sea water pools on the south coast, it has been closed following a heath and safety inspection. Rather than ringing to the sounds of local children splashing and enjoying them selves, it is looking rather sad and empty. Now if I were writing fiction, it wouldn’t be hard to concoct a plot where an unscrupulous developer arranges for a friend on the council to have the pool fail a safety inspection. 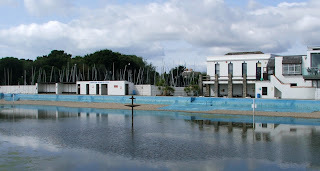 The cost to bring the pool back up to scratch is several million pounds, which the council is unable to afford, eventually the site is closed and sold off for housing development…. Of course that’s entirely fiction, just call me cynical. Out at the marina we spotted this lovely gaff sloop Windflower, she was restored a couple of years ago and looks delightful, she’s fast too. 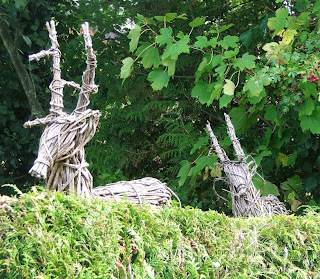 A lot of Lymington is very suburban, with mature hedges and gardens, we couldn’t help but smile at this arrangement which seemed to be very appropriate, with the New Forest. So close nearby. Passing this yacht in a local marina, I had to do a double take. 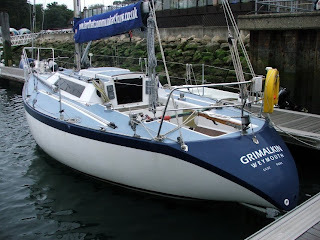 Grimalkin, apart from being the name of Nostradamus's cat, was the sloop at the centre of the 1979 Fastnet disaster. Over 15 sailors participating in the offshore race lost their lives as hurricane force winds swept up the western approaches in late August of that year. Of 306 yachts in the fleet racing out to the Fastnet rock, in the terrible conditions, 69 did not finish the race and 23 were either lost or abandoned. Of those Grimalkin was perhaps the most famous and most tragic. Having suffered several knockdowns, Grimalkin's owner was lost overboard, and two crewmen left critically injured. The remaining crew abandoned the 30 foot yacht, into the life raft. The yacht was later recovered, one of the two crewmembers, who had been left aboard, presumed dead, was still alive. Some internet research suggests that Grimalkin was subsequently refurbished, so I’m guessing this is the actual yacht. Comparison with the photo above, taken during the 70’s seems to confirm. Apologies for the lack of posts, we've been on holiday and with all good intentions I took the laptop, but you know how it is - the Internet cafe was shut, our lunch with friends ran over to five hours.... and, and. 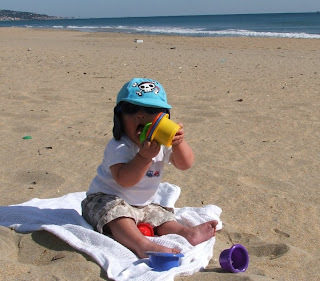 And besides, other people's holiday snaps can be, well a little dull. That said we did manage to find some interesting traditional boats while we were away, like this handsome and immaculately kept cutter. The picture doesn't do justice to the cabin sides which are each cut from one piece of what looks like a local pine, wonderful grain pattern and superbly varnished. 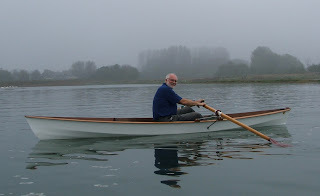 Traditional rowing is still very popular along this coast, all the local towns seem to have variations on this type of rowing boat, and in the summer competition between the teams is very fierce. 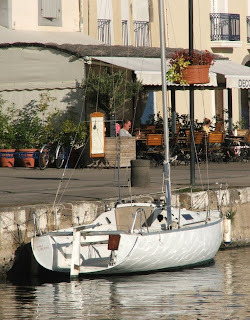 We were staying in Marseillan, a small port on the Etang de Thau, one of several, large salt water lagoons along the Languedoc coast of France. 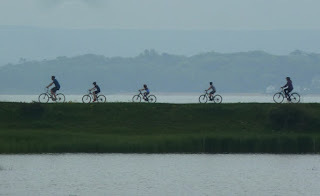 These large shallow lagoons are perfect for oyster culture for which the region is justly famous. 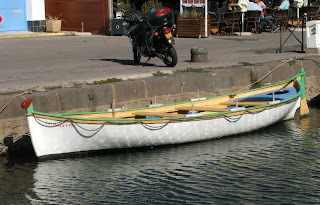 The commercial boats long ago converted to engine power, but there are more than a few traditional boats like this lanteen rigged dory. I spotted it under sail, but sadly it was too far away for a good photo, but we were lucky to catch up with it in the "Port de Pechers" on our way home. 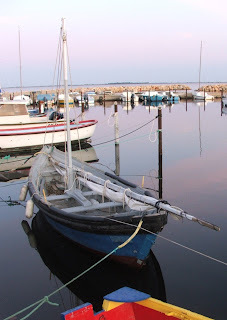 We didn't spend all of our time looking at old boats, the Mediterranean is literally "just over there", separated from the Etang by a sandy spit, twelve miles long, just a couple of hundred yards wide and almost deserted. Joe thought it was great. Now we're back in Bursledon, the garden's covered in leaves and it's decidedly cold!! Maybe it’s only in the UK, but the ongoing conflicts between motor boats and sailing vessels continues to fill the pages of our yachting press. The power boaters can’t understand why the yachts constantly change direction without warning (it’s called tacking); while the yachtsmen are equally vocal about powerboats passing close by, at high speed, kicking up a huge and dangerous wash.
Of course the exception proves the rule. The other day I was drifting around in my dinghy off Lands End Hard, I would have said I was sailing, but there was so little wind. Stuck right in the middle of the channel as I was, the owner of this powerboat, named “Ariadne” not only changed course, but slowed right down as he passed causing hardly a ripple. As they went by I gave a wave of thanks, but I don’t think he understood how grateful I was, so if you are reading this, thank you, your courteous action was very much appreciated.